Built 1930-1932 by Gabriel Desmeules, Ludger Robitaille and Pinsonneault. 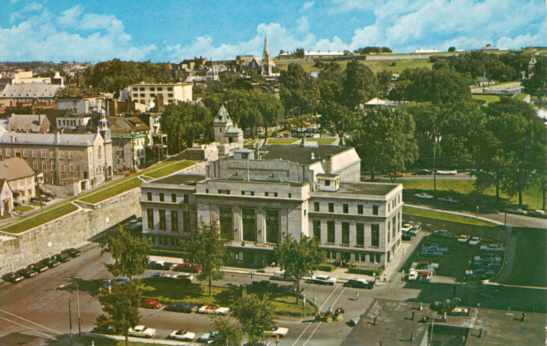 Opened 21 Oct 1932 as "Monument national" with a concert of the Société symphonique de Québec and tenor Raoul Jobin. The complex originally included a concert hall, a library and a swimming pool (closed in 1986). From 1932 to 1959 and from 1962 to 1970 home to the Orchestre symphonique de Québec. From the 1950s, venue of the Opéra national du Québec. 1989 concert hall renamed "Salle Raoul-Jobin" in honour of the Canadian tenor Raoul Jobin. Renovations and rebuildings in the 1990s and 2000s. Re-opened 2007. 1120 seats. Reverse Text: "Centre civique et théâtre municipal le Palais Montcalm. Civic Centre and Municipal Auditorium. Québec - Canada."